2 drawings on paper, lined and laminated (1 sheet) : ink ; left image 3.875 x 2.75 in., right image 3.875 x 2.75 in., on sheet 6 x 9.5 in. 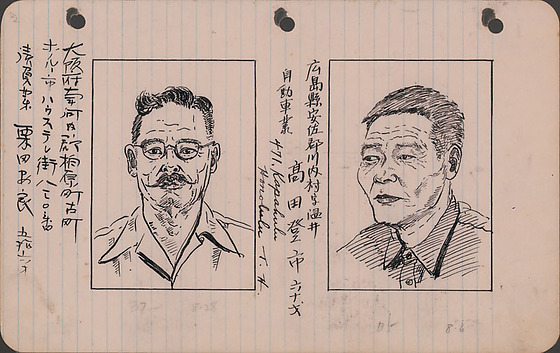 Ink portraits of two men, Yasuyoshi Kurita and Toichi Takata, at Lordsburg Justice Department Camp, New Mexico. Both drawings have black line borders. Left portrait of Yasuyoshi Kurita, 56 year-old man of Honolulu, Hawaii originally from Osaka, Japan. Dressed in a button-down shirt, glasses and curling mustache, Kurita looks directly at the viewer. His hair waves the the left. Right portrait of Toichi Takata, 60 year-old in the automobile business, originally from Hiroshima, Japan. Dressed in a dark button-down shirt, Takat looks to the viewer's left. His hair is combed forward and his face is lined. Written in black ink to left of left image (In Japanese): Osakafu Minami Kawachigun Kashiwaharamachi Funmachi / Honorurushi Hausuteregai 830 ban / Ukeoeggo Kurita Yasuyoshi (56 sai). Written in black ink left of right image (In Japanese): Hiroshimaken Ansagun Kawauchimura aza [unreadable] / Takata Toichi 60 sai / Jidoshgyo. Written in pencil below left image: 37- 8-28. Written in pencil below right image: B5 8-6. Written in pencil, top left corner: 142.